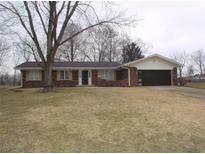 Below you can view all the homes for sale in the Sugar Creek Valley Estates subdivision located in Greenfield Indiana. Listings in Sugar Creek Valley Estates are updated daily from data we receive from the Indianapolis multiple listing service. To learn more about any of these homes or to receive custom notifications when a new property is listed for sale in Sugar Creek Valley Estates, give us a call at 480-577-2304. This Home Also Features A Living Room, Formal Dining Room, Spacious Family Room With Gas Log Fireplace, Three Bedrooms, Two Full Baths, Gas Heat With Central Air, Wonderful Spacious .46 Acre Wooded Lot, Large Two Car Attached Garage With Electric Door Opener, Refrigerator, Dishwasher, Laundry Closet, Located In The Mt. Vernon Schools, Plus More !! ! MLS#21624080. F.C. Tucker Company. Updates include newer roof (2012), HVAC (2016), water heater (2016), and well pump (2016). MLS#21623051. Stratton Realty Group, LLC. Freshly painted, and move in ready! MLS#21608467. RE/MAX Realty Group.